There is a new television program here called Stalker that I am watching and loving. Strange really, as I have been stalked. I house sat for a couple in a very large house, that was situated on a very large property. I lived there all alone, and did not worry about it at all. Dave was not too happy about the situation but I didn’t pay any attention to him. A few months after moving into the house I met someone at my friend’s pub. Fat Arnies was our regular hang out as it catered to motor sport enthusiasts. I met this guy and was polite to him, but nothing more. He however must have fixated on me as he got my number and called a few times. I saw him at the bar and would say hi, but I was usually with Dave, and if not with him, with friends. I would go there on a Monday night to play cards with my friend Jacques, and one Monday night this guy walked in and threatened to tell Dave we were sleeping together if I did not take him home for the night! Jacques, being quite a large guy told him to leave and he went on about knowing how I brushed my teeth at night etc. The only way he could have known this was if he had jumped over the 6 foot wall, avoided the dogs and climbed up to the second floor! I drove home, alone, not worried about him at all as even if he followed me, the house across the road had a full time security guard. The next morning I told Dave the threats this guy had made, and Dave told me that if he said anything again to give him my mobile phone and tell him to call Dave. With that dealt with I got on with my day. That evening I drove home, and as I got to the house I decided to go and get a take away pizza for supper. There is always a lot of traffic in Sandton and I paid no attention to the cars behind me. My stalker must have been waiting for me somewhere close to home as when I got out of my car in the parking lot he was there, at my door, making the same threats. I did as Dave suggested and gave him my phone, and he just laughed and attacked me. I was not going to let him win and so the next day Dave got a friend of ours involved. He was a detective with the police and his attitude was shoot to kill rather than fill in paper work for arrests. Craig went to ‘talk’ to my stalker and told him that if he ever saw me in a place that he was to leave immediately or there would be a big problem. My stalker must have been very scared as the next time I walked into a restaurant and saw him sitting there he got up, paid the bill and left. And this was 5 years down the line and in a different city! A situation like this can never be sweetened by anything and I would not wish this on anyone. What I would wish for you though is this sweet Vanilla Sugar. I keep a container of this in my pantry at all times, and all my baking is done with vanilla scented fructose. How scary! You have nerves of steel. I’d be a wimp I think. I always have a jar of vanilla sugar in the pantry. It comes in handy all the time. Hi Tandy, wow! what a scary situation, so glad it is over. Love this recipe!! I am also glad it is over! The vanilla sugar looks great and very useful! How scary! I am so glad he isn’t bothering you any longer! 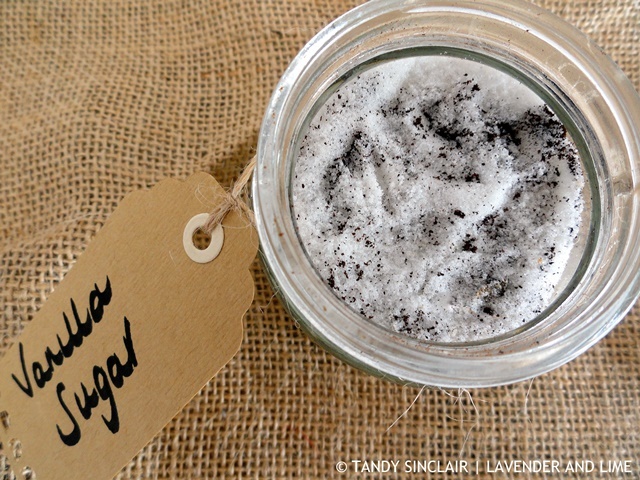 The vanilla sugar is such a great idea and so simple to make. Yes, we are watching and enjoying Stalker too! But how horrid for you to have been stalked. I love vanilla sugar and usually have a jar in the pantry. Wow, what a story! I can’t imagine how scary that must have been but I am glad the outcome was that he left you alone, for good! I’ve never tried vanilla sugar, but it sounds delightful! Oh my gosh, how scary!! So glad you’re okay! OMG. This story is scary. Glad that it’s ok right now… It’s so good to have friends and people to stand up for you…. Great idea with sugar! I always buy a ‘ready’ one. Oh my god, that’s horrific, Tandy! SO glad you had good people in your life to stand up for you and protect you, and so hugely proud of you for standing up for yourself. I was stalked too, by a neighbor. You’re right. It cannot be sweetened by anything, but good, protective friends and great cops make an awful situation so much easier to bear. Being stalked by a neighbour is awful as you cannot get away from them!